Lemon Vitality Oil (Citrus limon) can add a bright, dynamic flavor to many dishes. Its versatility in sweet and savory recipes is what makes this fruit a popular item in kitchens around the world. 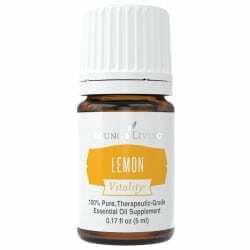 Use Young Living’s Lemon Vitality™ essential oil to add flavor to savory foods like fish and chicken or sweet foods like pastries and cakes. Goldenrod Essential Oil, 5 ml. Geranium Essential Oil, 15 ml.